This is an extraordinarily excellent sighting. What is critical is the white belly. 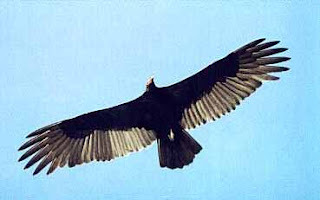 It is not an Andean Condor or any type of vulture. Better yet, the witness was in a position to try and measure the wing span. I think that his estimate of 35 feet will be about right. We have a black bird with a white belly and it glides easily. With a 35 foot wind span it is clearly a thunder bird. The size strongly suggests that it can carry of a deer. As posted earlier, its life way allows it to hide in the skirts of large trees. Once in the sky, the size is naturally misread and it is not recognized..